There’s a certain elegance that lavender brings to almost any dish. I displayed this before with my Honey-Lavender Stuffed Strawberries and had been wanting to rework that combo for a while. Well, I did. 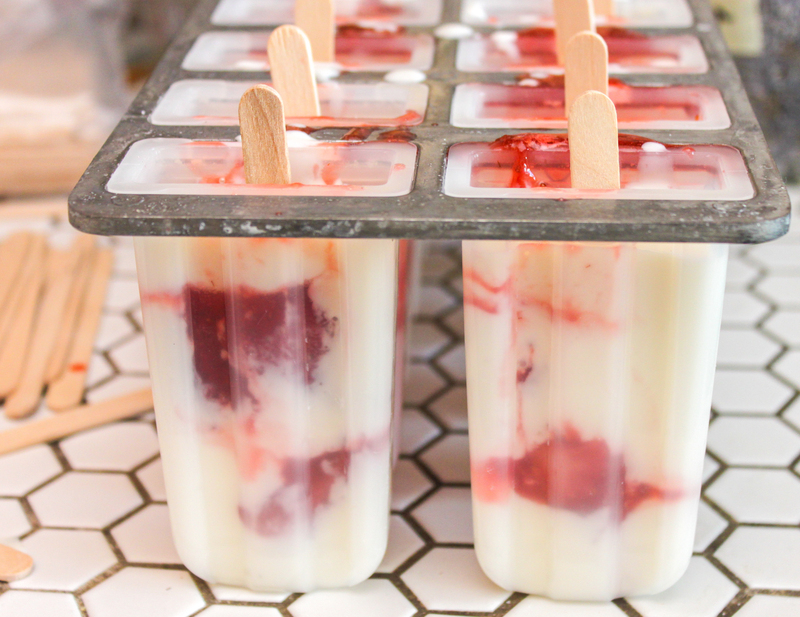 Check out these amazing popsicles! And trust me, you are gonna wanna get these in your mouth now. 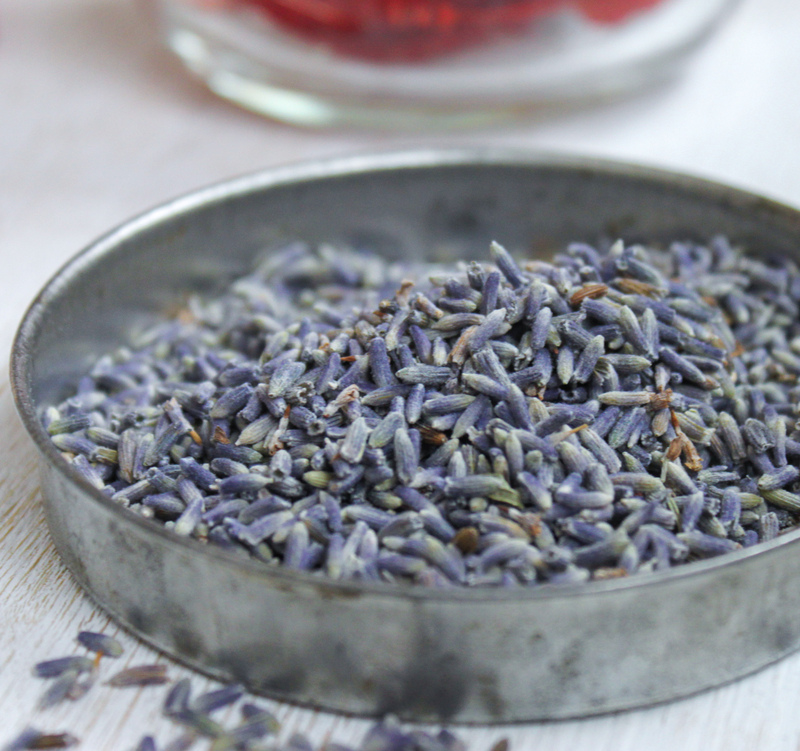 Take a tablespoon of lavender and add it to 1/2 cup of sugar and the cup of milk in a small sauce pan. Heat the mixture over a medium-low heat until the sugar is fully dissolved and then remove it from the burner. Let the lavender steep in the warm milk for about 5 minutes. 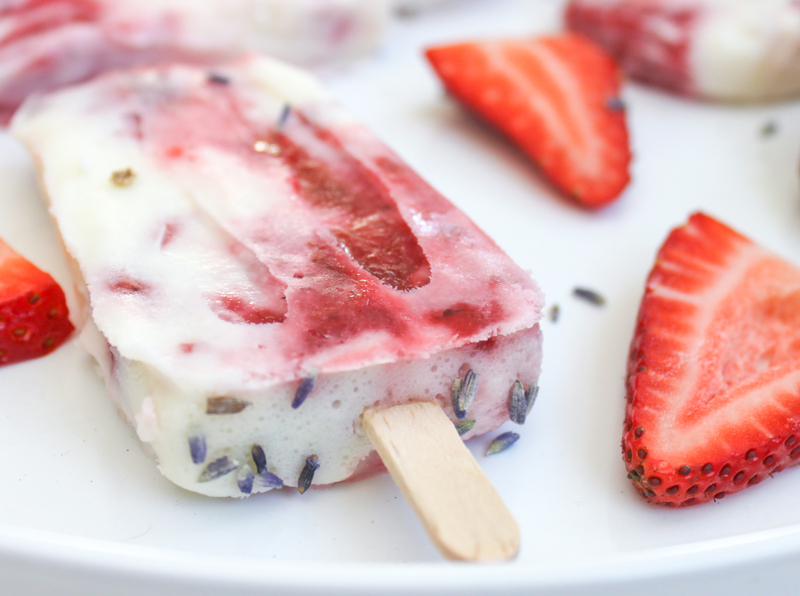 Now this is going to be a very delicate popsicle, if you want the lavender flavor to hit you over the head a bit, then use 2 heaping tablespoons of lavender and increase the sugar amount to 3/4 cup. I make these both ways depending on my mood. NOTE: Please make sure you are using culinary lavender. 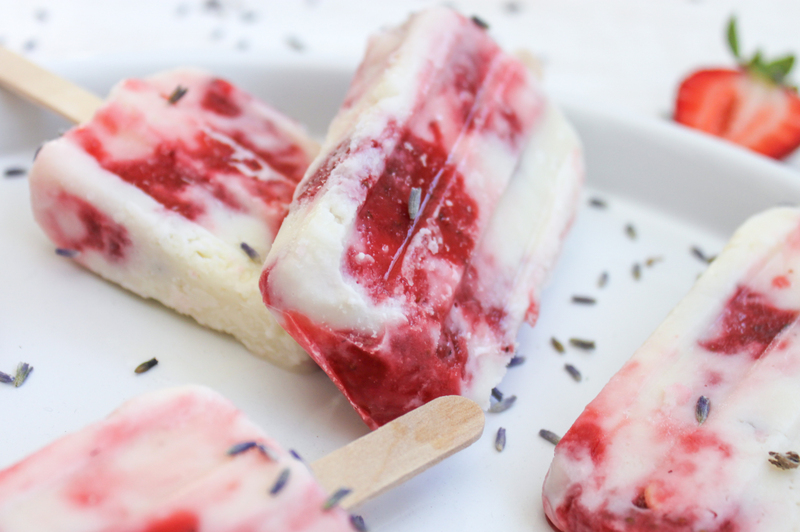 While all lavender is edible, culinary lavender is light and sweet. Other forms are higher in camphor which is bitter but also treated as a toxin by the body. 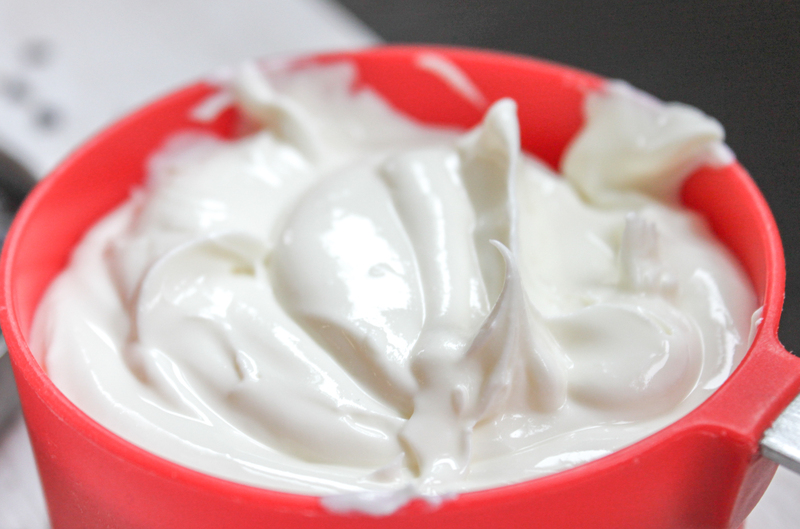 Once the lavender infused milk has cooled to room temperature, strain out the lavender and slowly work it into the Greek yogurt by adding 1/8 cup or so at a time and then whisking it together. You wan the milk to be cooled or the yogurt will curdle and, really, it's makes for an odd texture. Okay, let's be frank...it will be gross and make sucky popsicles. 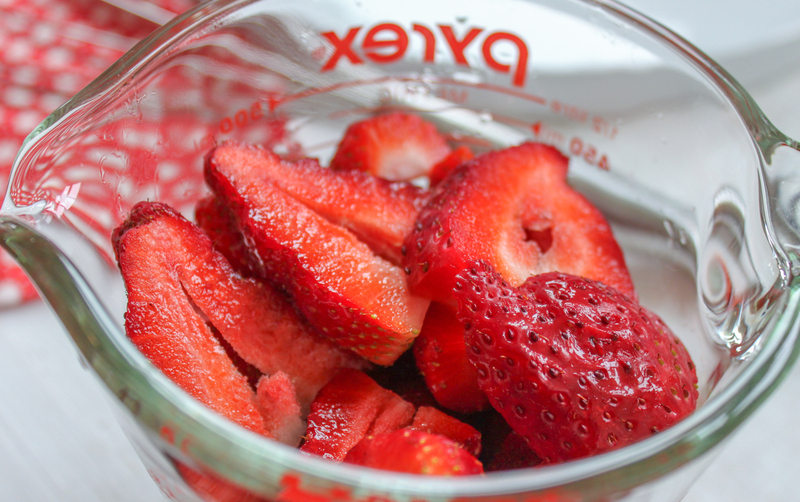 In a small sauce pan combine your lightly packed 2 cups of sliced strawberries and the remaining 1/2 cup of sugar and cook them over a medium-high heat, until they reduce. 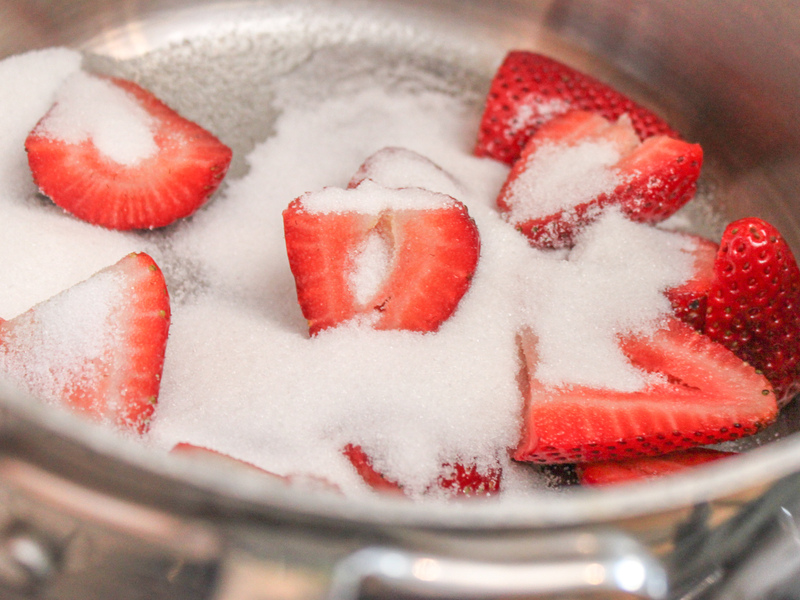 This should take 5 - 10 minutes and you should have 1 cup of strawberry syrup as a result. As a result, you should have 2 cups of lavender cream and 1 cup of strawberry syrup. My popsicle mold holds 3 cups total and if you have a different one, just adjust accordingly. 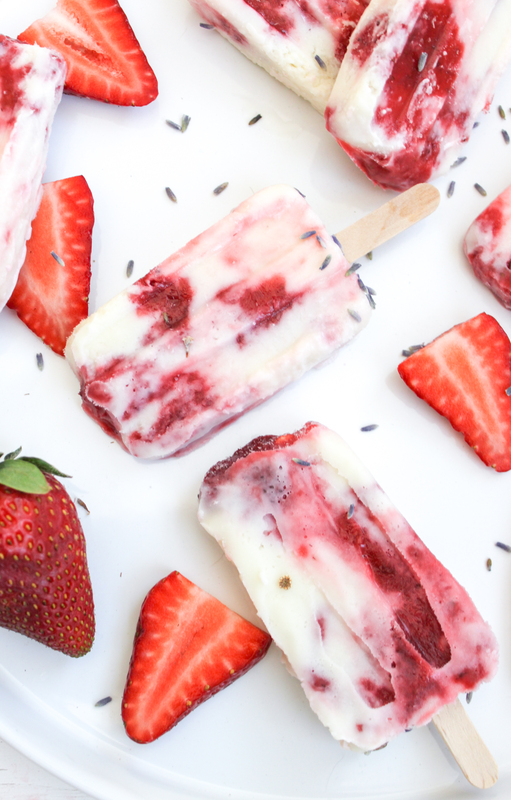 Alternating between the lavender cream and the strawberry syrup, add the mixtures to the popsicle mold, pouring carefully to create a marbled affect. Place a popsicle stick into each mold and freeze them for ten hours or more. NOTE: You don't have to do this but I topped mine with a bit of lavender before putting them in the freezer just to add some texture. I think they are really beautiful. 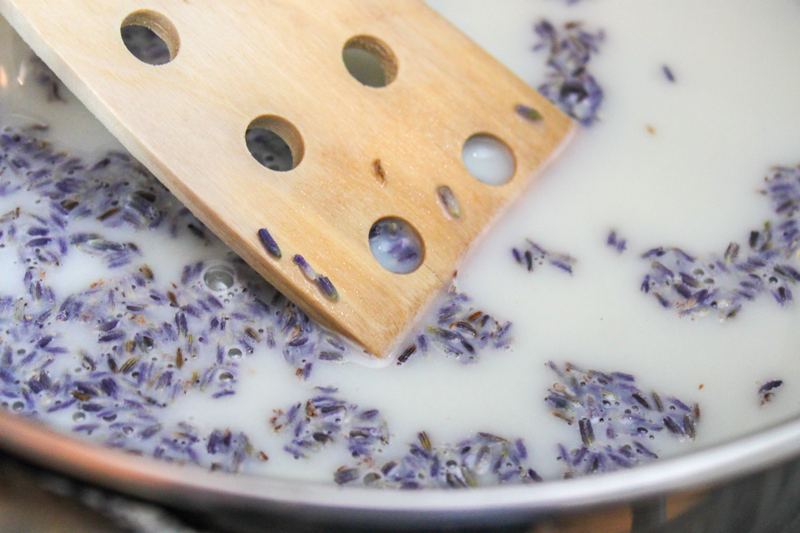 You could also not strain out all of the lavender when you infuse the milk. It should be softened enough to not be a weird texture once frozen in the pop. Food pornographer, full-time vegetarian, pointy beard enthusiast, and I say 'hella' too much. Founder and creator of Cooking Stoned. Are you hungry? Subscribe to our weekly newsletter! To your inbox. 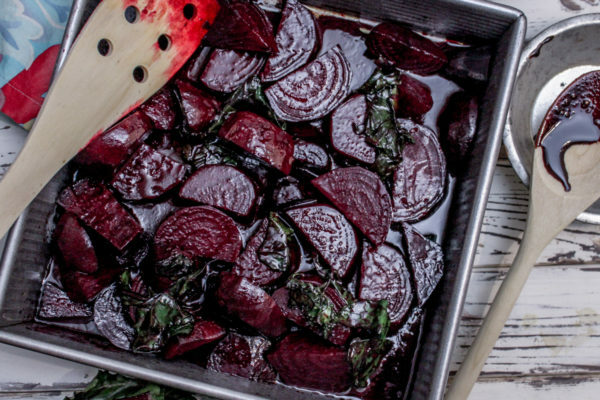 Get exclusive recipes, cooking tips, and so much more.